During December 2016 and January 2017 I wrote a new piece for the Manitoba Chamber Orchestra. The piece, entitled aaadagio, is a re-imagining of Barber’s Adagio for Strings… or at least, the first three chords of it. I’ve included a program note below, as well as a picture of one page of the score. You can hear the performance in Winnipeg, Manitoba on April 26, 2017. This piece was made possible by the generous support of the Manitoba Arts Council. For the last three years, I have not written a single note of music. Instead, I’ve made pieces collaboratively with musicians using any means except musical notation. I’ve made pieces that consist solely of orally-transmitted descriptions of an imaginary factory. I’ve made pieces that chew up existing music and spit it out into tangled new configurations. I’ve made pieces for art galleries that contain only speaking, not a note of music to be heard. 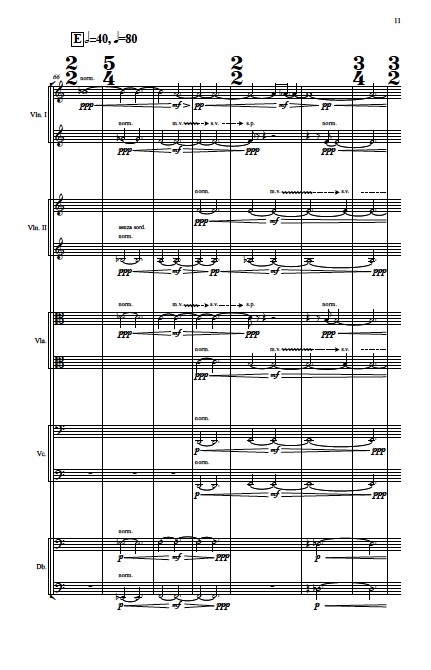 This piece for the Manitoba Chamber Orchestra marks my return to traditional musical notation. But with it I bring the great joy and endless possibility that I found using these other compositional methods. I like to imagine Barber’s Adagio as a great ship that sails calmly through our collective subconscious. In my piece, aaadagio, we listen to what lies beneath the behemoth ship. What turgid melodies swirl through the deep? What creaking sounds does the ship make while weathering a storm? How does light sound when it glints on the water? Full disclosure: I’m writing this description before I’ve written the piece, let alone heard it! So, please consider this a statement of intent, and forgive me if the piece you’re about to hear doesn’t quite match what you’ve read. A former composition teacher would often jokingly ask me what the effect would be if I used Barber’s Adagio to end of one of my compositions. This piece is my answer.